We specialize in the design and implementation of exterior spaces that enhance your outdoor living experience. Custom Planting Plans – Great landscapes start with personalized planting plans that work for your property, your lifestyle and your area. We are skilled in both formal and naturalistic planting designs that combine horticultural and ecological knowledge to create beautiful year round landscapes. Water Features – Koi ponds, fountains, waterfalls and other water features can add beauty, sound, lushness and intimacy to any landscape. 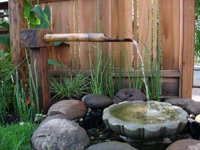 We design water features that compliment your home or property and transform the grounds into a unique setting. Walks and Patios – Carefully planned walkways and patios can enhance the functionality and visual appeal of your exterior spaces. We have years of experience designing walks and patios that work for any type of yard or outdoor space. Decks – An outdoor deck can add significant value to your property and at the same time become an exciting new space for entertainment and relaxation. We work with you to create a custom deck that reflects your own good taste, and that enables you to bring your indoor lifestyle out of doors. Pool Settings – Our landscape architects can design the perfect landscape to compliment your pool areas. The combination of water and hardscaping with lush plants can make for an unforgettable backyard. Yori Landscape Inc., (510) 659-1736, info@yorilandscape.com | Base Content Copyright © 2019 Market Hardware, Inc.